In Federalist #25 Alexander Hamilton continues his discussion of standing armies. Many contemporary Anti-Federalists had argued that, if standing armies were truly necessary, they should be raised and kept by the individual States. Hamilton disagrees with this idea on several fronts, first of which is that it would force the ‘common defense’ to rely too heavily on certain States. Additionally, jealousies would naturally rise between the more powerful and less powerful States and cause a break in the Union. Furthermore, a handful of larger States (Hamilton uses New York as an example) would be put in a position to protect their neighbors from any land attack (like Connecticut and New Jersey). Hamilton points out that the main problem is not that standing armies should not be raised, but rather that they should not be ‘kept up.’ ‘Kept up’ is a term used to describe an army that is standing in time of peace. No one seems to be arguing against an army being raised during times of war. However, as Hamilton demonstrates, if you wait until a war begins before raising an army, you have no opportunity to provide for defenses BEFORE an attack. While many Anti-Federalists argued that the local Militias would provide for imminent invasions, Hamilton opines that part-time soldiers would not be able to match the discipline and training of a professional army. The Constitution was written in the aftermath of Shays’ Rebellion in Massachusetts. Hamilton discusses this series of events in Federalist #25. He points out that Massachusetts raised an army to suppress the rebellion. Unfortunately, under the Articles of Confederation, this was technically illegal. To raise this army, Massachusetts should have theoretically received permission from the Continental Congress first. Of course, one of the main problems with the Articles was that nothing could ever get done and, therefore, Massachusetts would never have been able to suppress Shays’ and his cohorts. Hamilton insists that this type of ‘rule breaking’ is a dangerous precedent to set. Once you break one rule, it is easier and easier to continue until there are no more rules to follow. The Constitution, he asserts, provides the ability to raise an army, prepare defenses, and suppress rebellion while maintaining the necessary checks and balances to prevent the military forces from endangering the liberties of individual citizens. Do you want to learn about a Founder who discussed standing armies while a member of Parliament? 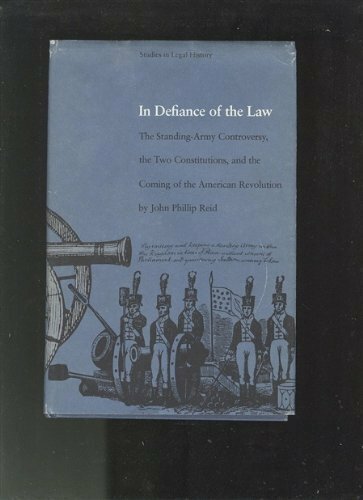 Want to read a great book about standing armies in the American Revolution? ‘In Defiance of the Law’ is the definitive authority on this subject. Pick up a copy through the Amazon affiliate link below (you’ll support this site, but don’t worry, Amazon pays me while your price stays the same) but be warned, it is very rare and therefore expensive.